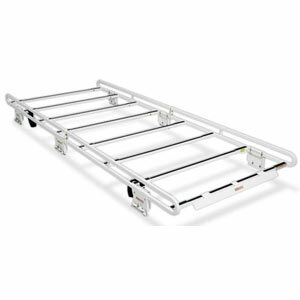 Excellent for hauling all types of materials, the Safari Rack easily accomodates 4-foot wide loads and distributes the weight evenly over eight cross members to protect the roof of the van. The OVAL RAIL DESIGN side rail is unique to WEATHER GUARD® Van Solutions. Front & Rear Cross Members extend over the ends of the van for protection when loading ladders and other long materials. Cross Members are constructed of 13-gauge, 11/4" x 11/4" square steel tubing and spread the load evenly to protect long, fragile materials. Stainless Steel Mounting Brackets are extra wide for superior attachment strength to the gutter. Air Foil eliminates wind noise and mounts to the front of the cross member. Anti-wear protection on cross members helps protect ladders and building materials during transport.